The Most Expensive Homes In Finance, Ranked! The top dogs in finance are worth millions and even billions, so it's no surprise they flaunt their exorbitant pay checks on the places they call home. We found the most expensive homes belonging to bankers, hedge funders, and the kings of finance. From oceanfront mansions with more rooms than you could possibly know what to do with to ritzy Manhattan penthouses with panoramic skyline views, any one of these properties will make you drool. To estimate the approximate current market value of the houses, we looked at public assessors' records and spoke to expert realtors in these homes' markets, including Kyle Egan, licensed real estate salesperson for Nest Seekers International, and Susan Breitenbach, licensed associate real estate broker with Corcoran Group. According to Curbed, Peter and Jill Kraus purchased this Park Ave. sweet spot for nearly double what the previous owner paid. 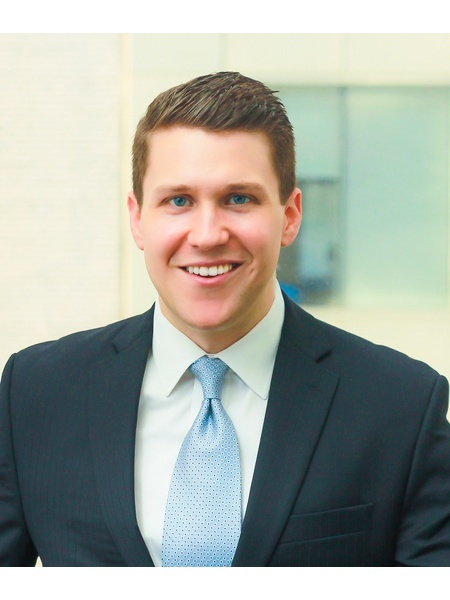 The former "Goldmanite" worked for just three months at Merrill Lynch before collecting his $25 million bonus and resigning, eventually purchasing this impressive apartment. Nest Seekers real estate broker Kyle Egan estimated the home at $30 million, based on a similar listing on another floor of the building. Title: Founder of Tiger Management Corp.
Julian Robertson purchased an apartment at the famous Hampshire House on Central Park South for "just" $3.9 million, and later came to occupy the entire 27th floor, according to Egan. Given the high per-square-foot prices of a Park-facing unit, Roberton's five-apartment combination — totaling 8,000 square feet — is valued around $30 million. The property was built by the grandfather of Jackie Kennedy Onassis, and has been home to numerous wealthy individuals, from David Koch to Vera Wang. Living here, however, comes with very high maintenance fees and carrying charges. Eddie Lampert set records for the most expensive single-family home in Indian Creek Island when he purchased this property for $40 million in 2012. It's an extra-impressive feat, considering the neighborhood's affluence. The seven-bedroom, Italian-style home is set on 2.7 acres in Biscayne Bay, and includes luxurious features like a reflecting pool at the entrance. Public assessor records estimate the home is worth $30.3 million today. In a 2011 buyer's market, Stephen Friedheimpurchased a penthouse on Fifth Avenue for the bargain price of $26.75 million. The apartment had been listed for $46.5 million since 2008, before Friedheim snatched it up at a recession-friendly price. The apartment has partial views of the park and the Metropolitan Museum, and was renovated from two separate apartments on the 12th and 13th floors. Egan estimates the home value at $40 million, given the prices of similar Fifth Ave. apartments. Marc Lasry purchased this extravagant, six-floor townhouse on the Upper East side, which has previously been home to bothMichael Jackson and artist Marc Chagall. The nearly 12,000-square-foot home was gutted and revamped by the Lasrys, with a billiard room, home gym, wet bar, and library. The billionaire hedge funder also decorates the home every year for Halloween with tons of spooky decorations. Similar townhouses in NYC list at around $3,207 per square foot, so Egan estimates their property could be worth as much as $40 million. Boaz Weinstein purchased one of threeapartments owned by Huguette Clark, the late, reclusive copper heiress. He paid $25.5 million, $1 million over the asking price, for the top floor apartment at 907 Fifth Avenue. The home is said to be architecturally stunning, and includes four bedrooms as well as separate staff quarters. Due to market trends, Egan places a value of $40 million and up for the penthouse home. Gene "Tiger" Sykes purchased an amazing Bel Air mansion with its own name, La Belle Vie, for $40 million in 2011 and reportedly paid in cash. The 35,000-square-foot palace has eight bedrooms, 21 bathrooms, three kitchens, a gym, pool, beauty salon, wine cellar, and tennis court. According to public assessor records, the home is now worth around $41.6 million. Property Shark listed Sykes as one of the top 10 LA property tax payers, with nearly half a million in taxes. According to Curbed, Daniel Benton won the Park Ave. penthouse in an all-out bidding war among New York City's wealthiest prospective buyers. The home has a giant living room, solarium, greenhouse, glass-ceiling breakfast room, and five terraces. The former owner, a Goldman Sachs exec, was asking for about $35 million, in cash, no less. Benton picked it up for $39 million, and today, Egan values the home at $45 million. The notoriously secretive founder of Cerberus Capital Management bought the 103-year-old townhouse, formerly operating as an Egyptian mission, for just under $20 million in 2003. Unlike other townhouses in the Upper East Side, Steve Feinberg's property is a freestanding mansion, with over 16,000 square feet of space. Feinberg invested more than $15 million in remodeling, and Egan says the building could be worth as much as $50 million today. Carl Icahn purchased an East Hampton home on Lily Pond Lane, one of the most elite streets in the Northeast. Bon Jovi, Martha Stewart, and Steven Spielberg have all called it home at some point. The estate isn't just made up of one house, but three. Its estimated value is up $50 million from $44 million last year, according to associate real estate broker Susan Breitenbach. Title: Founder of Paulson & Co. Inc. Hedge fund manager John Paulson nabbed the opulent 90-acre ranch, nestled on the slopes of Aspen's Red Mountain, from a Saudi Arabian prince in 2012. The property, dubbed "Star Ranch," has appreciated about $3 million since its purchase and is valued at $52 million, according to the Pitkin County public assessor's records. The home is the largest property in Pitkin County, and that probably won't change anytime soon. Prince Bandar bin Sultan built the main residence — larger than the White House — in 1991; afterward, county officials limited home sizes to 15,000 square feet, according to Bloomberg. The New York Observer reported in 2012 that Robert Bass had bought the triplex apartment at 834 Fifth Ave. for $42 million from fellow hedge funder Damien Mezzacappa. Egan says the value of the place has appreciated in recent years, up to $55 million. Bass paid just $2 million less for the half-floor apartment than Rupert Murdoch paid for the triplex in the same building, according to the New York Observer. Noam Gottesman is the only Manhattanite on this list whose home appears south of Central Park. He paid $34 million in 2009 for photographer Albert Watson's West Village pad, making him the proud owner of a 20,000-square-foot studio and townhouse. Gottesman reportedly encountered "structural problems" while renovating the place, prompting him to tear it down and rebuild it from the ground up. It's largely the same format as before (he had promised the Landmarks Commission that he would rebuild the house as he'd bought it), save for the larger fourth floor and new windows that let in a ton of natural light. With "neighbors asking $2,500 – $3,000 per square foot," Egan estimates the value of the property to be at least $60 million today. The former home of Penthouse magazine publisher Bob Guccione, Phil Falcone and family bought the 25,000-square-foot residence in 2008 for $49 million and gut-renovated it. The Falcones spent at least $10 million to give the home an indoor pool, sauna, security room, elevators, movie theater, and heated sidewalks. Egan thinks the home could fetch $70 million today. David Tepper bought a $43.5 million oceanfront property in Sagaponack, covering 6.5 acres and 500 feet of beach, but immediately tore down the existing home to start building from scratch. The estate is now nearly complete, and double the size of the previous residence. Aerial photos reveal it will have a luxurious pool, two hot tubs, and a tennis court. Given the massive amount of construction that's been done, the value will likely increase. Breitenbach estimates that the home is now worth $70 million. Goldman Sachs CEO Lloyd Blankfein paid $25.7 million in cash for his 15 Central Park West corner duplex back in 2006. The condo covers more than 7,200 square feet of indoor and outdoor space, and has four bedrooms and 6.5 bathrooms. Blankfein also owns a gorgeous home in Bridgehampton, worth more than $32 million. But of course, his 15 CPW address offers an easier commute to work. "If previous estimates are correct, it's worth in the neighborhood of $70 million this year," Egan says. Living among his fellow hedge fund managers at 740 Park Ave., Howard Marks consolidated two adjoining duplex apartments into one gorgeous home. Their combined $52.5 million sale set the record as the most expensive co-op in the city's history in 2012, Egan says. Marks now enjoys 30 rooms on the 12th and 13th floors, including eight bedrooms, 10 bathrooms, a private elevator, elliptical staircases, two libraries, and seven fireplaces. "With historically low inventory and high demand, prices in the Upper East Side have surged over the last year," says Egan, who estimates the home's value at $70 million. Title: CEO and Chairman of MacAndrews & Forbes Holdings Inc.
Ron Perlman's 57-acre estate is named "The Creeks," and has been called "the most important house in East Hampton." While Perlman bought the property for just $12.5 million in 1990, it proved to be a great investment — worth as much as $80 million today, according to Breitenbach. The billionaire owns a lot of property, but this 40-room residence — with its breathtaking views of Georgica Pond and proximity to a coastal lagoon — is one of his most valuable. Title: Cofounder of Kohlberg Kravis Roberts & Co.
Henry Kravis' plus-sized, 26-room apartment at 625 Park Ave. houses a gallery, ballroom, dining room, and recreation room.According to the New York Observer, he bought the apartment for $15 million in 1994 from Iranian Princess Ashraf Pahlavi, and spent another $7 million on decorating and furnishings. The apartment's value has held steady at $80 million since last year. "There is currently an apartment on the sixth floor asking $3,358 per square foot," Egan says, "I doubt the value of the property has changed much." It was reported by The Real Estalker last April that Steve Cohen had listed his massive Upper East Side penthouse at the illustrious One Beacon Court for sale. On the market originally for $115 million, Cohen eventually brought the listing down to $98 million and still failed to find a buyer, The Real Deal reported earlier this month. Cohen bought the duplex for $24 million back in 2005, hiring the late architect Charles Gwathmey to renovate it. At 9,000 square feet, the penthouse comes with six bedrooms, 6.5 bathrooms, and floor-to-ceiling windows. Though the last listing price was $98 million, Egan thinks that might be overshooting it. "While the apartment benefits from a beautiful renovation and incredible views, and tops off one of Midtown’s premier condos, new developments like One57 and 432 Park are bringing between $7,000 and $10,000 per square foot for top floor units/penthouses," he notes. "I would estimate this property to be worth closer to $90 million." Dan Loeb's eight-bedroom, over 10,000-square-foot penthouse condo broke records with its $45 million price tag when he bought it in 2005. Back then, 15 Central Park West was still a construction site, just the beginning of the luxury address that it is today. The penthouse Loeb lives in features 360-degree views, servant's quarters, an expansive deck, and a large library. Loeb, who competes in triathlons, had a bit of a spat with some of the moms who live in the building over the temperature of the 75-foot lap pool Loeb likes to train in, but the matter was soon resolved amicably. Egan puts Loeb's apartment in the $90 million value range, based on average closings in the building and accounting for the penthouse's private outdoor space. Bruce Kovner bought his near 17,000-square-foot estate on the east side of Central Park back in 2001 for a modest $17 million. He then spent another $10 million making renovations, turning the former International Center of Photography into his private home. "The property ... is one of only a handful of private homes to front Fifth Avenue from 60th Street to 110th Street," says Egan, describing it as a "benchmark property." Part of the value is written into the building's long and architecturally significant history. It was built in 1915 by Willard Straight and designed by the architect Delano Aldrich, and served as a home to a number of wealthy New Yorkers before the International Center of Photography took up residence there. Israel "Izzy" Englander was already living at 740 Park Avenue when in June he also bought the 18-room duplex below him for a reported $70 million with the intent, one could infer, of turning the whole thing into one massive triplex. The former owner of the duplex (the French ambassador to the U.N.) was originally asking $48 million, meaning Englander shelled out an additional $22 million over the asking price. Interestingly enough, despite the fact that Englander is already a resident of the building, he "hasn't yet officially passed the co-op board's muster," according to Curbed. The total value of Englander's holdings in the building is about $95 million, Egan says. At 110,000 square feet, Ira Rennert's Sagaponack estate is the largest private home in the entire country. The wealthy investor built the house in the late '90s on 63 acres of land. It features a whopping 29 bedrooms, 39 bathrooms, a bowling alley, a basketball court, two tennis courts, and a $15,000 hot tub. The estimated value was a very high $247.8 million last year, but Breitenbach says its value has dipped as low as $100 million today. Scott Bommer is known for his house-flipping success stories, and his recent scoop is one of the most impressive. Bommer bought not one, but three properties on Lily Pond Lane, the exclusive East Hampton drag. He purchased 93 Lily Pond Lane, as well as 101 and 97, which weren't even on the market. It's unclear whether Bommer will turn this into one gigantic mansion, or keep them separate. Breitenbach estimates that the combined property is worth $100 million, regardless. Daniel Och was an early buyer in 15 Central Park West, home to some of the most recognizable names in the world, including Denzel Washington, Sting, and Jeff Gordon. He snagged the top floor of the 43-story luxury tower for just over $41 million. Even before it was finished he was already using the place to entertain, holding a birthday party at which the band Five for Fighting performed on a stage constructed on the terrace. "Prices in 2007 when Mr. Och purchased the property were around $3,500 - $4,000 per square foot," says Egan. "With trades today of as much as $10,000 per square foot, it's possible that this apartment would bring over $100 million today." There are no photos available of the allusive co-founder of Alternative Asset Managers, L.P. Title: Cofounder of Alternative Asset Managers, L.P.
Randall Yanker's three penthouses atop the Ritz-Carlton in Battery Park City currently hold the title of priciest listing in New York City — with good reason. If the buyer combined the three separate apartments, nicknamed "The Penthouse Collection," the sprawl would cover over 15,000 square feet of indoor space plus four terraces. Homeowners in the Ritz-Carlton also benefit from the hotel's amenities, including a five-star restaurant, valet parking, room service, housekeeping, and spa and gym access. Outspoken hedge funder Bill Ackman spent between $90 and $100 million on a residence in One57, the tallest residential building in Manhattan. 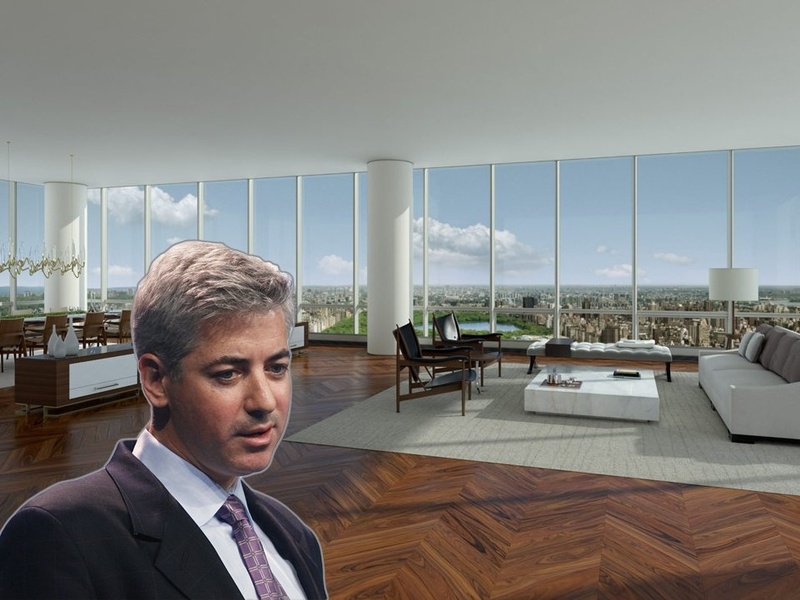 Ackman has previously stated that he's not looking to personally live in the duplex, which occupies the 75th and 76th floors in the 90-story building, but that it was purely an investment. "With other units in the building asking more than $7,000 per square foot, I think this was a very sound investment for Ackman who could seek as much as $8,500 – $9,000 per square foot for the 14,000-square-foot duplex," Egan says. This apartment could possibly fetch upwards of $119 million, he tells Business Insider, if Ackman decided to sell the place today. The apartment's most impressive feature is a two-story, 51-foot-wide glass enclosed “winter garden” with a curved glass roof. Steve Schwarzman bought the fab triplex penthouse at 740 Park Ave. for somewhere between $35 and $40 million — and being that this was back in 2000, prices have certainly appreciated since then. "It's perhaps the finest residence at this highly coveted address," Egan says. Formerly occupied by the likes of Jackie O. and John D. Rockefeller, the 37-room home features 11 fireplaces, 43 closets, a gym, sauna, steam room, billiards room, screening room, and servants' quarters. Egan pegs the current value of the apartment at around $120 million — about three times what Schwarzman paid for the place 14 years ago.